As early as 1908, another work had been proposed as a possible influence on Robinson Crusoe: the twelfth century philosophical romance, The History of Hayy Ibn Yaqzâm, by the Moorish author, Abu Bakr Ibn Tufail.9 The History tells of an untaught feral child who achieves intellectual and spiritual enlightenment while alone on a desolate island. The story was eventually translated by Edward Pococke the Younger into Latin in 1671 as Philosophus Autodidactus and into English by Simon Ockley—and thus was accessible to Defoe—in 1708,10 and may well have influenced John Locke’s An Essay Concerning Human Understanding (1690), given that Locke had been a student of Pococke.11 However, although the romance mentions footprints, it is not their presence but rather their absence that is described. In addition, the narrative lacks any element of surprise.12 Furthermore, the History is not listed in the Olive Payne catalogue. Included in Defoe’s copy of the Apophthegmes of the Ancients was an anecdote about a Greek philosopher and friend of Socrates named Aristippus (fl. ca. 435−386 BCE), who was shipwrecked on a seemingly deserted island: “Having been cast ashore by a Tempest on a desart Coast, and spying some Mathematical Schemes upon the Land: ‘Courage,’ said he, ‘I see some marks of men here.’ Note, the Barbarians, whom he treats as beasts, were not capable of those Sciences” (Apophthegmes 222). Like Robinson Crusoe, the Greek castaway Aristippus made an astonishing discovery on a deserted beach, a detailed pattern in the sand (recall the specificity of Crusoe’s words: “the very print of a foot, toes, heel, and every part of a foot”) that disclosed that another human being was living on an island he had previously assumed was uninhabited.17 In addition, the ancient Greek tale also incorporates a theme very much a part of Defoe’s novel but not at all evident in the accounts by Knox, Dampier, or Smeeks: the contrast between civilization and savagery. 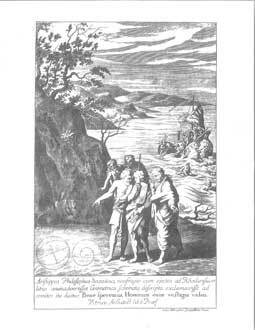 As the editor of the Apophthegmes of the Ancients makes clear in his commentary, beast-like barbarians were incapable of such sciences as geometry, dependent as such sciences are upon the cultivation of reason, a faculty celebrated in Robinson Crusoe.18 Notably absent from the episode, however, is any reference to an actual footprint like the one described in Defoe’s novel. That Defoe knew of the writer Vitruvius is demonstrated by the fact that he once praised Lord Burlington as a modern Vitruvius for his design of Tottenham Park, “built by our Modern Vitruvius, the Earl of Burlington, who gave to English Architecture the elegance and politeness of Italian taste” (Defoe, Tour, qtd. in Harris 16n5). Vitruvius’ name was, in fact, renowned in Defoe’s day because of the Palladio-inspired revival of the Classical style of architecture in Britain under the leadership of Inigo Jones (1573−1652), whose designs were celebrated in Colen Campbell’s elaborately illustrated work, Vitruvius Britannicus; or, The British Architect (1715−1725). Campbell’s first volume had appeared just four years before the publication of Robinson Crusoe, and the second volume appeared in the very same year as the novel. Indeed, Robert Harley, first Earl of Oxford and Defoe’s patron, was one of many wealthy Englishmen who with their subscriptions underwrote the publication of Campbell’s work (Campbell 1: 9). Defoe’s interest in architecture in general is manifest in his A Tour thro’ the Whole Island of Great Britain (1724−1727) and is attested to by the fact that the Olive Payne catalogue includes over a dozen books on the topic of architecture. Had Defoe somehow encountered the story of Aristippus in its Vitruvian version that included the “footprints of man” metaphor, in what type of edition would he have read it? A complete English translation of De Architectura, including the crucial sixth book that opens with the anecdote,did not appear until 1791, long after Defoe’s death.24 This English edition had been preceded by a series of Italian translations in 1556, 1567, and 1629, which were in turn followed by a French translation in 1673. Therefore, Defoe would have had to have read Vitruvius in Italian or French, had he access to those editions, or in the original Latin, which would certainly have been available to him. Assuming he had the inclination, was he capable of reading and understanding these languages? Defoe’s own testimony is that he knew all three languages, though he detested the display of Latin as a contemptible aristocratic conceit.25 Yet his having read Vitruvius is mere speculation since no copy of Vitruvius’ work is listed in the Olive Payne inventory of Defoe’s library. 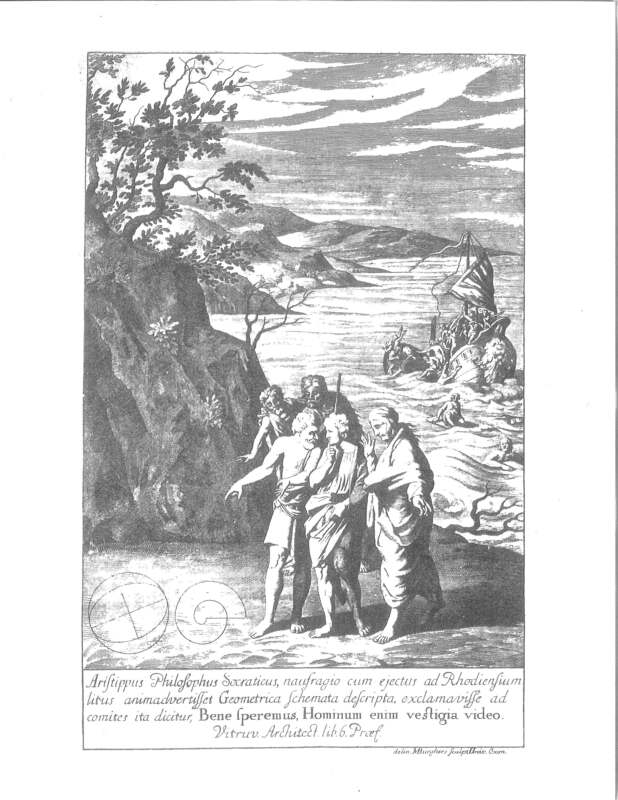 To summarize, in conceptualizing the discovery scene in his novel, Defoe may have been influenced first by his youthful encounter with Udall’s English translation of the Apophthegmes of Erasmus; by his subsequent acquisition of a copy of the Apophthegmes of the Ancients; by possibly having read Vitruvius’ original version of the Aristippus story; and perhaps, just perhaps, by having seen Burghers’ engraving. 2019 will mark the three hundredth anniversary of the publication of Defoe’s Robinson Crusoe. In the almost three centuries since it appeared, wave after wave has washed over the sands of Crusoe’s beach, obliterating that memorable footprint and obscuring its literary inspiration. Despite this, however, the most important footprints still remain: those of the author who once boldly trod those shores in his vivid imagination and invited us, and all future generations, to share in the grand adventure.